I am a lover of the outdoors and love to go backpacking in wilderness areas every chance I get. 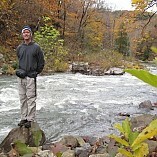 My website is www.backpackersreview.com, where I produce videos with Dan Nash. Our videos share backpacking tips and gear reviews.